TERM — This is the length of the mortgage contract in years, and rate type. Tip: You’ll pay a penalty if you break a mortgage before its term is up, unless it’s an open mortgage. Switch/Renew — A switch (a.k.a. “transfer” or “renewal”) is when you changing lenders but do not: increase the mortgage amount, increase the loan-to-value, increase the amortization, add a line of credit, change from a line of credit to a regular mortgage or change the title. Pre-Approval — A pre-approval confirms your qualifications and holds your interest rate while you are shopping for a new home to purchase yet. Pre-approvals do not apply if you already know the address of the property you are mortgaging. Pre-approvals are also not available on switches or refinances. To obtain a pre-approval, please email us at team@intellimortgage.com. Pre-approvals are not available through the Mortgage Builder. Rental — This refers to financing on a non-owner-occupied property that is rented out. To obtain a rental financing quote, please email us at team@intellimortgage.com. Due to its added complexity, rental financing is not available through the Mortgage Builder. MORTGAGE AMOUNT — The total amount of your mortgage. This number is used to calculate your mortgage payment. Tip: Do not add default insurance fees here, but be aware that they are required if you have less than 20% equity. HOME VALUE — Enter the purchase price if you’re buying a home. If you’re refinancing or switching lenders, enter the recent appraised value or your best conservative estimate of the value, whichever is less. CLOSING DATE — The date on which you need the mortgage funds. Tip: In some provinces, like B.C., the closing date is not the date you take possession. AMORTIZATION — The number of years it will take to pay off your mortgage, assuming you don’t refinance or make any extra payments. PROVINCE — The province of the subject property that you need to mortgage. Select any mortgage options you like. The list of lenders matching your criteria will update right away. To deselect an option, simply click the “x” next to that option. PORTABLE — Lets you move your mortgage to a new property without paying a penalty. To port, you must meet the lender’s qualification criteria at the time. EXTRA TIME TO PORT — Gives you more time (60+ days total) to port your existing mortgage to a new property and avoid a penalty. Many lenders give you only 30 days to port your mortgage. The problem is that it’s sometimes not possible to close your new home within 30 days of the sale (closing) of your old home. SKIP A PAYMENT — Lets you skip at least one payment per year. DISCOUNTED PENALTY — A penalty based on the lender’s normal interest rates, as opposed to artificially inflated posted rates (like at the Big 6 banks and many credit unions). The difference can be thousands, even tens of thousands, of dollars depending on your mortgage amount, term remaining and interest rates. INCREASE WITHOUT PENALTY — Lets you add money to your mortgage with no penalty, typically at fully discounted rates. Another term for this is “blend and increase.” When utilizing this option, the lender will blend your existing rate on your “old” money with its current rate on the “new” money, and your remaining term will typically stay the same. EXTEND TERM WITHOUT PENALTY — Gives you the ability to extend your mortgage term with no penalty. 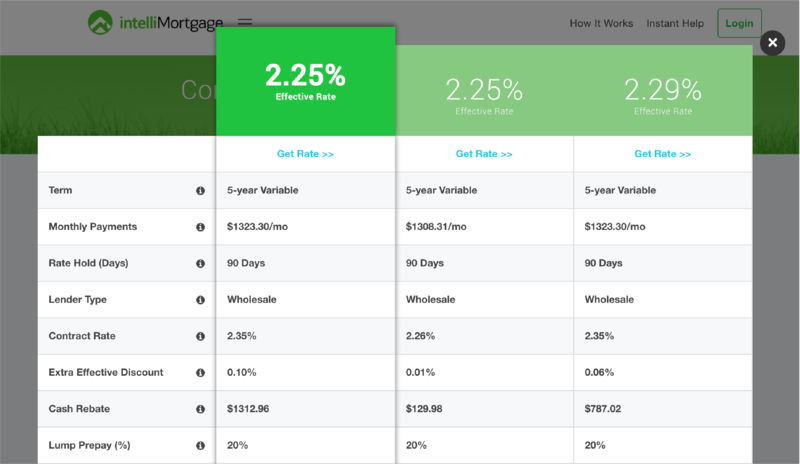 This is handy if you want to: (a) lock in for longer, before rates go up; or (b) blend your current rate with a lower rate in the future (i.e., average down your rate). Blends & extends are not common with variable-rate mortgages. 15%+ PAYMENT INCREASE — This let’s you increase your payments by at least 15% each year, in order to pay off the mortgage quicker. DOUBLE-UP PAYMENTS — Lets you make an extra payment without penalty on any normal payment date. 5-10% LUMP-SUM PREPAYMENTS — Lets you pre-pay an extra 5% to 10% of your original mortgage amount (depending on the lender) every year, without triggering a penalty. 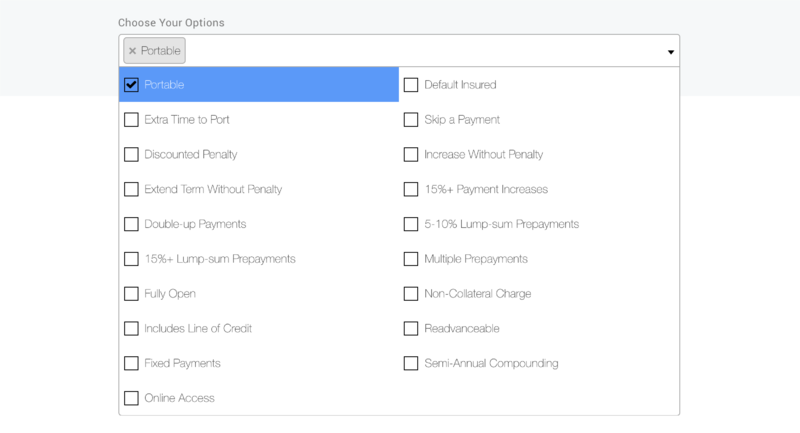 15%+ LUMP-SUM PREPAYMENTS — Lets you pre-pay at least 15% of your original mortgage amount (depending on the lender) every year, without triggering a penalty. FULLY OPEN — Lets you pay off the entire mortgage at any time without penalty. Rates on open mortgages are usually much higher because they’re more expensive for lenders, and the lender is not assured of making a profit. NON-COLLATERAL CHARGE — A “collateral charge” is a type of mortgage that lets you increase your mortgage without paying legal fees. The downside is that it’s often more expensive to switch lenders at maturity (because most lenders don’t pay your switching costs if you have a collateral charge). In addition, you rarely get the lender’s lowest rates on any new funds that you add to a collateral charge mortgage after closing. As a result, some people prefer the flexibility of a non-collateral charge mortgage. INCLUDES LINE OF CREDIT — A secured line of credit can be attached to your mortgage. Typically, when you make a principal payment on your mortgage, the lender lets you reborrow those funds from the secured line of credit. But you typically must re-apply and there may be limits to how often you can do so. READVANCEABLE — A readvanceable mortgage includes a secured line of credit whereby you do not have to manually request permission from the lender to reborrow paid-down principal. It’s automatic, meaning the minute you make a principal payment, those funds are available for you to reborrow from the line of credit. FIXED PAYMENTS — Applies to variable-rate mortgages only. 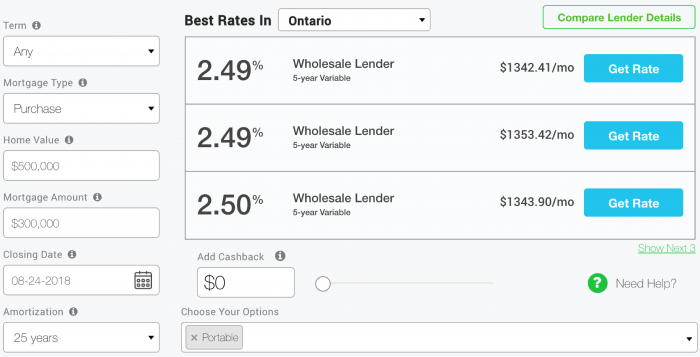 This option keeps your payments fixed if prime rate goes up or down. But keep in mind, if prime rate rises so much that you’re not at least covering your interest (e.g., 2.00 percentage points or more), your payment will typically increase. SEMI-ANNUAL COMPOUNDING — Costs you marginally less interest than monthly compounding. Fixed rates compound semi-annually, but many variable rates compound monthly. ONLINE ACCESS — Lets you check your balance and amortization online. In some cases, you can even make prepayments online. If you need cash on closing to pay for legal fees, closing costs, furniture or repairs, simply add it using the Cashback slider. The rate will rise just enough to cover our cost of advancing these funds to you. Cash rebates are received on or before the 19th day of the month following your closing. You can easily compare the three displayed rates that match your criteria. To do that, click any <More Info> button and the comparison matrix will appear. Once you find a rate you love, click <Get Rate> and we’ll take care of the rest! You’ll hear from us within 4 business hours of submitting your application. For help anytime, live chat or email us at info@intellimortgage.com.